Merriam-Webster’s online dictionary provides a succinct definition, saying that a loose cannon is “… a dangerously uncontrollable person or thing,” which nails it, all right. However, an interesting aspect of this idiom is that there is not necessarily a sense of either willfulness nor innocence attached to the phrase. Whether someone is a deliberate mischief-maker or acts on pure id is beside the point. First and foremost is what that person is, and that is a loose cannon. Unpredictable. Unstoppable. Something terrifying indeed. 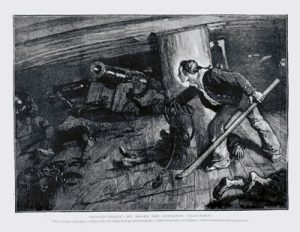 An 1874 Victorian print shows a sailor devastated by the rolling havoc wrought by what would later be called a loose cannon. The guns on these vessels were lined up on both sides of the warships and often on more than one deck. This was done in order to provide massive directed fire, called a broadside, to withering effect on opposing ships. To view a sea battle two or three hundred years ago was to witness a massive slug fest among majestic, slow-moving ships. 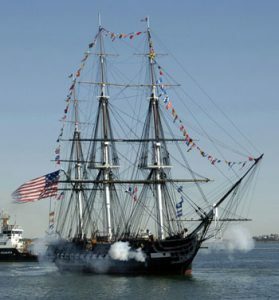 “USS Constitution,” a three-masted, 44-gun heavy frigate launched in 1797, is still in U.S. Navy service. Although wooden-hulled, it received the nickname “Old Ironsides” in the course of a one-on-one battle with the British frigate “Guerrier” wherein enemy cannon balls were seen to bounce off the American ship’s rugged oaken sides. 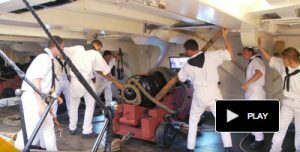 Click to see “USS Constitution” crew members perform loading and firing drills. Running cannons inboard for loading, and then pulling them outboard for aiming and firing required a lot of heavy heave-hoing on the part of highly-trained gun crews. The gunnery sailors would haul on tackle that consisted of ropes run through an arrangement of heavy block pulleys. 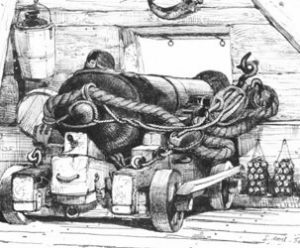 This tackle, running on both sides of a gun, was secured to the ship’s bulwark and then to a stout four-wheeled carriage that cradled each cannon. A 36-pounder long gun at the ready. Sometimes, during the heat of battle or due to material fatigue, both of these riggings as well as the thick breach line (used to break the recoil of a fired gun) would snap. And then all hell would break loose, with as much as 3,400 pounds of cast bronze or iron rolling wildly on deck, pushed back and forth by the action of the sea. A loose cannon would smash into other cannons, crew members, masts and sometimes even punch a hole in a ship’s side. Hence the disconcerting reality behind the phrase a loose cannon, and why that figure of speech is still so evocative. Famed French novelist Victor Hugo (1802 – 1885) first described what in English would be called a loose cannon. 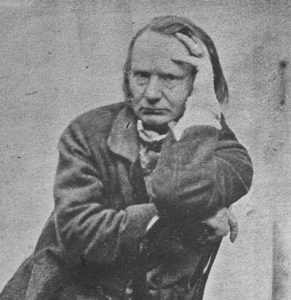 It should be noted however that the expression a loose cannon itself did not emerge from the experiences of sailors, but instead from the imagination of Victor Hugo, author of Les Misérables and The Hunchback of Notre-Dame, as well as a long list of other historical works of fiction, according to the website The Phrase Finder. By the end of the 19th century the expression a loose cannon began to be used figuratively with the meaning it has today. And the rest, as they say, is etymology. This entry was posted on Sunday, May 8th, 2016 at 2:32 pmand is filed under . You can follow any responses to this entry through the RSS 2.0 feed. You can leave a response, or trackback from your own site.